Bird flu infects people. Swine flu infects people. But canine flu? That one goes straight to the dogs, which means Buddy may need his VeryOwnFluShot™. Aww! Poor pooches. For most healthy dogs, the risk is low if pets stay at home. Dogs kept at kennels and other places where canines are grouped together have the greatest chance of catching the flu. The American Veterinary Medical Association is warning dog owners to speak to their vets before boarding dogs in kennels this fall, due to the risk of canine influenza virus (CIV), reports USA Today. 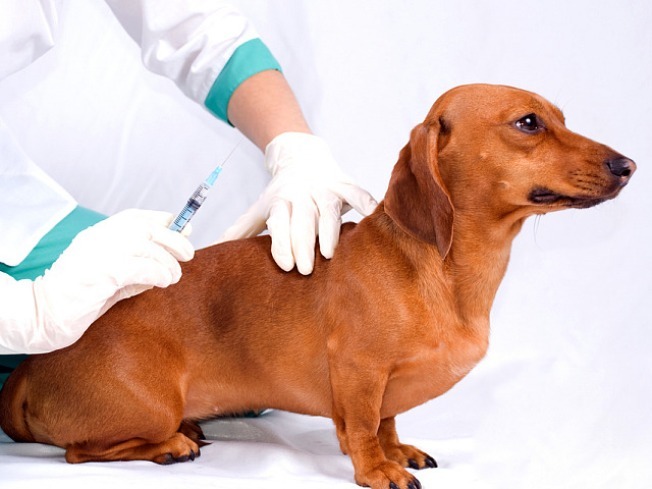 Vets are recommending that dogs at risk receive a series of two vaccinations. The shots, given four to six weeks apart, should cost about $20 each. CIV is rarely fatal and, unlike swine flu, humans cannot get this virus from dogs, according to the Centers for Disease Control and Prevention. But it causes acute respiratory infections in dogs, and virtually all dogs who are exposed become infected. During the incubation period of two to four days, pets who appear healthy can still be spreading the germs. Symptoms of canine flu -- also known as H3N8, in case you were wondering -- include a runny nose, coughing, sneezing and fever. In rare and severe cases, dogs may develop pneumonia which could lead to death. In mid-August, an outbreak of canine flu caused the Fairfax County Animal Shelter to limit dog adoptions. While no dogs died, at least two cases of flu were confirmed, with several more suspected cases. No dogs affiliated with the shelter died of the illness. The shelter is expected to reopen the weekend of Sept. 26-27.